This week’s maintenance will occur at a much earlier time than usual. Weekly Maintenance schedule is also posted in the calendar. You have until April 2nd’s maintenance to pick up the rewards from the ARKS Unity Festival. AC is expected to expire 1 year from the date it was last purchased. If the last purchase date listed on your account is between April 1st, 2013 ~ April 30th, 2013, you must purchase AC as soon as possible to extend the expiration date. Due to the stacking of both boost events, [A Boisterous White Day 2] will achieve +150% EXP Boost on April 7th. 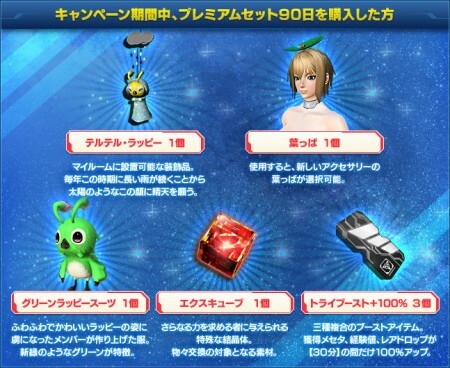 Then on April 8th, [A Boisterous White Day 2] will achieve a +150% Rare Drop Boost. Purchase Premium Sets during the campaign period to receive several items. You must purchase the premium set tickets, merely using them will not qualify you for the campaign. You can purchase several different types of premium sets to qualify for each prize tier. (i.e. Premium Set 90 Day + Premium Set 60 Day nets you  and ) However, purchasing the same premium set several times only qualifies you once for that particular prize. (i.e Premium Set 60 Day + Premium Set 60 Day only nets you ). If you purchase 3000 AC with Webmoney during the campaign period, you’ll be entered into a drawing for a chance to receive a PSO2 designed Webmoney card worth 5000 Points. The card will be sent to the physical address listed on the SEGA ID account.